Quartz countertops are also virtually maintenance-free. They are easy to clean, requiring nothing more than warm, soapy water. Once the counters have been installed, there is no sealing or polishing needed. The non-porous nature of the stone makes the counters resistant to stains from food, juices, wine, coffee, tea, and even nail polish. Versatility is another of the most appealing advantages of quartz countertops. They can be used for many different applications during a kitchen renovation. 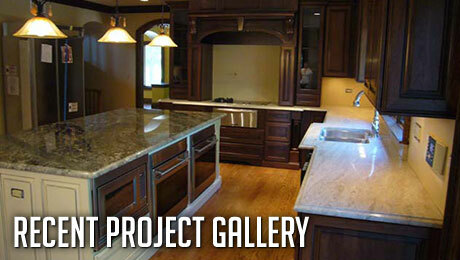 Countertops, islands, wet bars, tabletops, desktops, and backsplashes are just some of the uses for quartz countertops. They can also be used as fireplace surrounds, tub and shower surrounds, floors, and vanities. 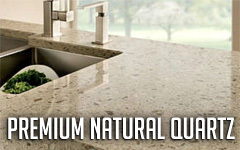 The strength and durability of quartz countertops are also prominent advantages. The added resin makes them often more durable than natural stone. Countertops with a lot of quartz in them can have a rating of 7 out of 10 on the Mohs hardness scale, a test used to grade the scratch resistance of minerals. As an example, talc gets a rating of 1 on the scale, and diamond has a rating of 10. This hardness makes the countertops difficult to scratch and chip. Quartz countertops are also scratch- and scorch-resistant. Although excessive force with a sharp edge, or prolonged exposure to heat, may cause slight damage, the occasional kitchen mishap will not leave a mark on quartz. Hygiene is another important advantage of quartz countertops. Because the surface is non-porous, they may be less susceptible to hosting bacteria than other types of countertops. 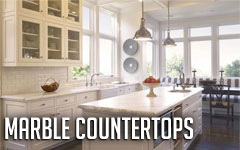 Most countertops with quartz do not take in much moisture and bacteria, and do not require sealing to be food safe. Many manufacturers certify their quartz counters to meet international standards of safety for food preparation and hygiene.